My Mobster at Hollywood Fringe! 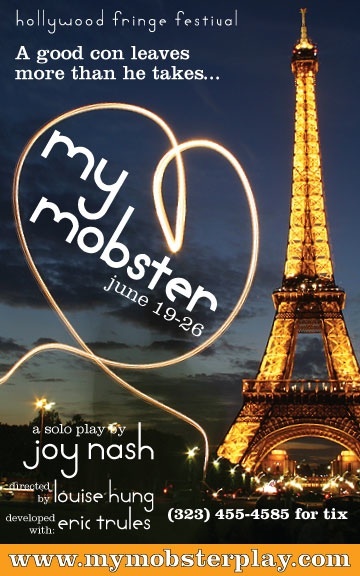 MY MOBSTER is a solo play by Joy Nash detailing the true story of a relationship between a naive young American and a criminal from France. Toss in a hyper-religious mildly racist mother, a love-hate relationship with an intact virginity, and voodoo…MY MOBSTER is 80 minutes of solo show for people who hate solo shows. That sounds awesome, but what is a solo play? I’ve never seen one. Are you playing all the roles yourself? I hope you come to Detroit. Would love to see your play. Good luck! Didn’t i hear that My Mobster was going to be at the Oahu Fringe Festival Nov. 10th at 5:30pm and Nov. 12th at 10pm? If so maybe you should share it with your fans? Maybe they know people in Oahu? Maybe they live in Oahu?